COAST’S MOST IDYLLIC LOCATIONS AND ONE OF AUSTRALIA’S MOST POPULAR AND RENOWNED HOLIDAY DESTINATIONS. Fairshore’s first class two-bedroom modern apartments front the sands of Noosa Main Beach and offer uninterrupted ocean views. Fairshore Beachfront Apartments certainly has a lot to offer with its breathtaking location, modern apartments and plethora of facilities that provide a winning formula for guests. It sounds incredible to say that this resort could be any less than perfect, but they did have a niggling problem that was cause for concern, a problem that plagued this beautiful resort – below standard Internet coverage. Fairshore Beachfront Apartments was offering free wireless Internet to their guests via a Netcom system with an external antenna at the beach side of the complex but this Internet had very limited coverage and depth. This was a cause for much complaint to the management and was certainly not what their discerning guests had come to expect. 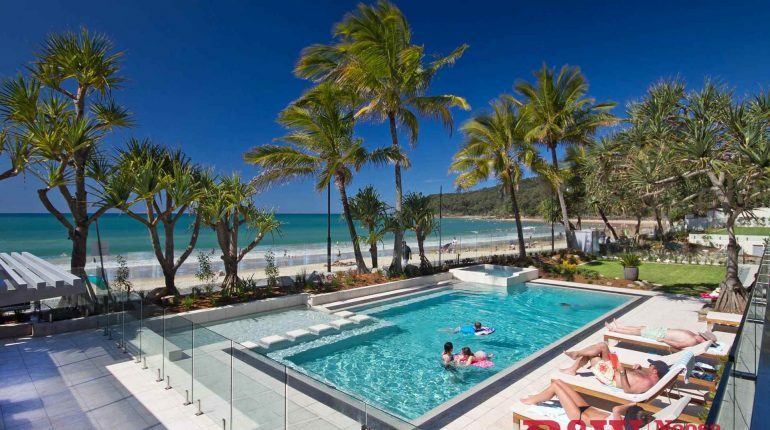 Jodie Cooney is the operations manager at Accom Noosa that manages Fairshore Beachfront Apartments and she explained that the resort had experienced a lack of coverage with the previous routers making the Internet very slow and unreliable. Fairshore’s body corporate had aimed to provide reliable, securely managed, free wireless Internet access to all guests throughout their 30 apartments, so they approached Time Out Internet for a solution. Time Out Internet is a company that provides Internet solutions to those businesses that wish to provide an efficient and fast public wifi service to their customers. This 100% Australian-owned business is based in Queensland on the Sunshine Coast and was launched in 2011 by Peter Trollope and Judy Senn, with over 30 years combined IT experience between them. They recognised a gap in the commercial market for easy to use and cost effective wifi hotspot, guest wifi and Internet management system solutions. “There was no other affordable and easy to use system I could find that seems to be able to control Internet usage to this extent for commercial use. Nothing that covered all devices that can be connected to the Internet,” explained Peter Trollope. Time Out Internet assessed the situation at Fairshore Beachfront Apartments. The concerns with Internet speed and unreliable access were looked at and they prepared a specifically designed technology and support solution for the managers and body corporate to consider. The customised package that the company presented to Fairshore provided the resort with the resources required to deliver wireless Internet services to their guests while protecting the business from inappropriate Internet usage. In addition, they recommended that two Time Out Internet high powered external access points be mounted on poles on the beach side of the complex. With two high powered external access points installed on posts on the roof top of the barbecue area, close to the street side of the complex. Each of these high powered external access points would provide wireless access to guests staying in the complex, internally and externally, managed by the Time Out Internet Flexi Gateway Controller located in the switch room in the car park. Fairshore Beachfront Apartments now offers guests 1Gb of free data per day per room and the system allows five people or five devices to utilise wifi at the same time with each unique username and password and the 1Gb of data is shared. If guests would like more data the resort happily obliges. It was suggested by Time Out Internet to manage the guest’s data in this manner as opposed to giving unlimited data as the resort had initially intended. From the experience at Fairshore, Jodie is keen to recommend the Time Out Internet management system, as it has proven advantageous, especially with its ease of use and the many options it has given them. They do this by using Time Out Internet’s Access Control Server. This exists in “the cloud” and can be accessed via a unique username and password, giving managers the tools to manage their guest wifi from any device anywhere, as long as they are connected to the Internet. The Access Control Server is supported and maintained by Time Out Internet and all updates to the server, enhancements to the system, added features and functions are included in the annual pricing.